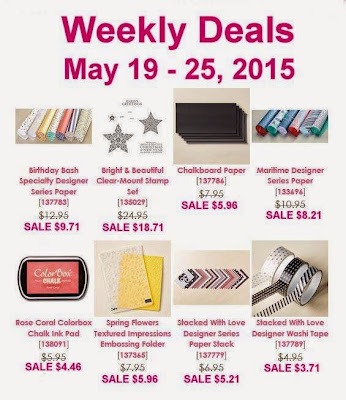 Just popping in to share the New WEEKLY DEALS for this week with ya! You can shop 24/7 online in my ONLINE STORE, ships right to your front door! Combine Clearance Rack, Weekly Deals, Mini Catalog & Annual Catalog (both end June 2nd) and Retiring List items and My Digitial Studio (MDS) digital downloads - all at once, on one order and save on shipping! If you would like a personal HOSTESS CODE, please text me at 602-570-7867 if you will be shopping frequently with smaller orders so that they can be combined together for hostess benenfits. If you're spending $150 or more, there's no need as you'll earn Hostess benefits (aka Stampin Rewards) immediately. Thanks! Crazy busy with Graduation and Grad Party and all the last ever high school moments happening! I'll be back but thank you for understanding! !